Bezymianny (Russia). Thermal anomalies observed in satellite imagery during 4-5 and 8 June. The Aviation Colour Code remained at Yellow. Cleveland (Alaska, USA). Alaska Volcano Observatory reports no activity or unrest detected 4-11 June, and the Volcano Alert Level/Aviation Colour Code was lowered to Unassigned. Melimoyu (Chile). The Alert Leve was raised to Green Level 2 on 8 June because of increased seismicity during May. On 27 May there were nine long-period earthquakes; six long-period earthquakes on 28 May preceded two separate seismic swarms, the first located 2-12 km beneath the summit and the second 7-14 km S of the summit at depths no greater than 15 km. All earthquakes were M 2.5 or less. Pacaya (Guatemala). White-and-blue fumarolic plumes rose 300 m from MacKenney cone during 9-10 June, generating sounds ‘like aeroplane engines’ that were audible up to 5 km away. Occasional ash plumes drifted 2 km NW. Lava flows continued to be active on the SE flank and moved at a speed of about 1 m per hour. Explosions continued from a lateral crater. San Cristóbal (Nicaragua). Washington VAAC reported that a well-defined ash plume drifted about 115 km WNW on 9 June. Sarigan (Mariana Islands). No further volcanic activity has been detected since the submarine eruption of 29 May, and the Volcano Alert Level/Aviation Color Code was lowered to Unassigned on 10 June. Tungurahua (Ecuador). Steam-and-ash plumes were observed rising to 5.5-8 km a.s.l. during 9-12 June. Daily reports of ashfall came from multiple areas within about 8 km NW, W and SW, but ash was noted as far away as 22 km NW and 25 km W on 9 June. Blocks, some incandescent, were occasionally ejected by explosions and rolled up to 1 km down the flanks. Explosions produced ‘cannon shot’ noises and vibrating windows almost daily. During 13-14 June steam plumes from the crater and the NW flank rose 500-1,000 m above the crater and drifted W. An explosion on 15 June generated an ash plume that rose to an altitude of 7 km a.s.l. and drifted W.
Ulawun (Papua New Guinea). White and grey plumes rose 800-900 m during 9-16 June. Fine ashfall was reported almost daily and affected the NW, W and SW flanks. During 9-12 June occasional rumbling noises were reported. Fluctuating incandescence from the crater was seen at night on 9 and 10 June from areas to the SW and for a brief period of time on 13 June from areas to the N.
Bagana (Papua New Guinea). Darwin VAAC reported that ash plumes rose to 3 km a.s.l. during 13-14 June and drifted 75-205 km SW and W.
Batu Tara (Indonesia). Darwin VAAC reported that during 9 and 11-15 June ash plumes from Batu Tara rose to 2.4 km a.s.l. and drifted 35-65 km W and NW. Dukono (Indonesia). Darwin VAAC reported that during 9-10 June an ash plume from Dukono was seen in satellite imagery drifting 130 km W.
Eyjafjallajökull (Iceland). On 9 June rumbling noises were heard at Gígjökull just before a steam cloud rose from the summit crater. The crater area was not visible the next day but a few small shallow earthquakes beneath the summit crater continued to be detected. On 11 June white steam was mainly confined to the crater but occasionally a steam plume rose higher than the rim. Heavy rainfall during the previous few days led to flooding along the Svadbaelisa River. The water contained a large amount of mud and flowed over levees into fields. A lake about 300 m in diameter has formed in the large summit crater. Steam rose as high as 1 km from the rims, especially from the N side. Two small vents above the water level on the W side emitted brown-coloured clouds. Fuego (Guatemala). During 10-11 June multiple explosions produced ash plumes that rose to 4.1-4.3 km a.s.l. and drifted NW. Rumbling and ‘degassing’ sounds were associated with the explosions. Occasionally incandescent material was ejected as high as 75 m above the crater and avalanches descended the flanks. Fine ashfall was reported in Sangre de Cristo, 10 km WSW. During a period of increased activity on 11 June shock waves were detected as far away as 5 km. Gaua (Vanuatu). Wellington VAAC reported that on 7 June an ash plume rose to 3 km a.s.l. Karymsky (Russia). During 4-11 June seismic activity was above background levels, and suggested that possible ash plumes rose to an altitude of 2.5 km a.s.l. on 6 June. Satellite imagery revealed a thermal anomaly over the volcano during 4-5 and 8 June. Tokyo VAAC reported that on 11 June an eruption produced an ash plume that rose to an altitude of 6.1 km a.s.l. and drifted NE and SE. The Aviation Colour Code level remained at Orange. Kilauea (Hawaii, USA). During 9-15 June activity continued from the summit and the east rift zone. At the summit the level of a lava-pool surface remained mostly stable in the deep pit inset within the floor of Halema’uma’u crater; glow from the vent was visible. A plume from the vent mainly drifted SW dropping small amounts of tephra downwind. Vigorous bubbling of the lava surface was seen during 14-15 June. At the east rift zone, lava flows that broke out of the TEB lava-tube system at 580 m elevation built up rootless shields. Minor surface lava flows from the shields were often active on the pali and the coastal plain, and advanced along the W side of the TEB flow field towards the abandoned Royal Gardens subdivision. The Pu’u ‘O’o web camera recorded a growing and sometimes circulating lava pond on the crater floor that was an estimated 300 x 125 m in dimension. The pond was fed predominantly from a source near the N rim of the Pu’u ‘O’o, with some contributions from a source near the S shore. Kliuchevskoi (Russia). 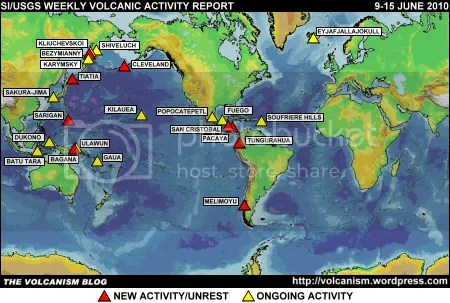 During 4-11 June seismic activity was above background levels and Strombolian activity was seen. Gas-and-steam plumes occasionally containing a small amount of ash were also noted. On 5 June ash plumes rose to an altitude of 7.3 km a.s.l. Satellite imagery revealed a large daily thermal anomaly from the volcano, and ash plumes that drifted 60-190 km NE on 5 and 8 June. The Aviation Colour Code level remained at Orange. Popocatépetl (Mexico). During 9-11 June steam-and-gas emissions occasionally contained small amounts of ash. On 10 June an ash-and-steam plume rose 800 m above the crater. The next day an ash-and-gas plume rose 1 km above the crater. Later that day, another ash-and-gas plume rose 600 m.
Sakura-jima (Japan). Explosions were reported by Tokyo VAAC during 12-14 June. Details of possible resulting plumes were not reported. On 15 June an ash plume at an altitude of 3 km a.s.l. was reported by a pilot. Shiveluch (Russia). During 4-11 June seismic activity was above background levels and hot avalanches were seen at night. The seismic data suggested that possible ash plumes rose to an altitude of 4.1 km a.s.l. during 3-4 and 6 June. Ash plumes were seen during 4-6 and 9 June rising to an altitude of 4.5 km a.s.l. Satellite imagery showed a large daily thermal anomaly over the lava dome and ash plumes that drifted 100 km SE on 4 June. The Aviation Colour Code level remained at Orange. Soufrière Hills (Montserrat). There were rockfalls and pyroclastic flows from the lava dome during 4-11 June. The largest pyroclastic flow originated in the collapse scar and traveled 1 km N. The Hazard Level remained at 3. 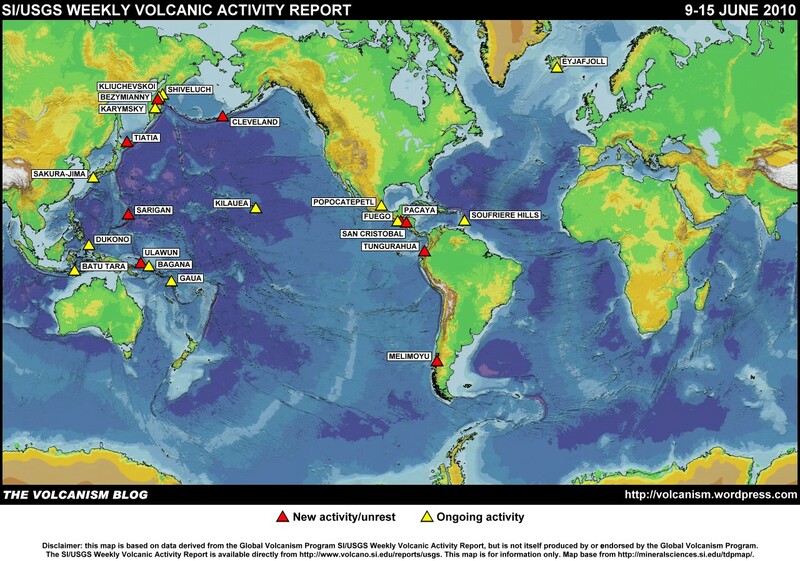 The foregoing is a summary of the Smithsonian Institution/United States Geological Survey Weekly Volcanic Activity Report covering 9-15 June 2010. It is provided for information only, and is based on but not a substitute for the full report, which comes with its own criteria and disclaimers. The map base is derived from the Smithsonian Institution/USGS/US Naval Research Laboratory This Dynamic Planet website. I am happy with your come back in the volcanic blogging sphere. Welcome back. Hope all is well, best wishes. Many thanks, Bernard and parclair. Slowly, things are returning to something like normal! Great you’re back, and I really hope you’ll be around for a long time without any serious reasons to interrupt!